Nha Trang may be a coastal city, but serves up more than just seafood. Attracting more international tourists every year, the city caters to all kinds of tastes. So, what would you like to eat today? Burgers? Sushi? Kebab? Or would you prefer to keep it local and stick to noodle soups or some delicious seafood fried rice? Even if you haven’t decided yet, it doesn’t matter – let us help you choose a venue to go and indulge. Sandals is a fancy beach front eatery set within Nha Trang’s iconic Sailing Club. 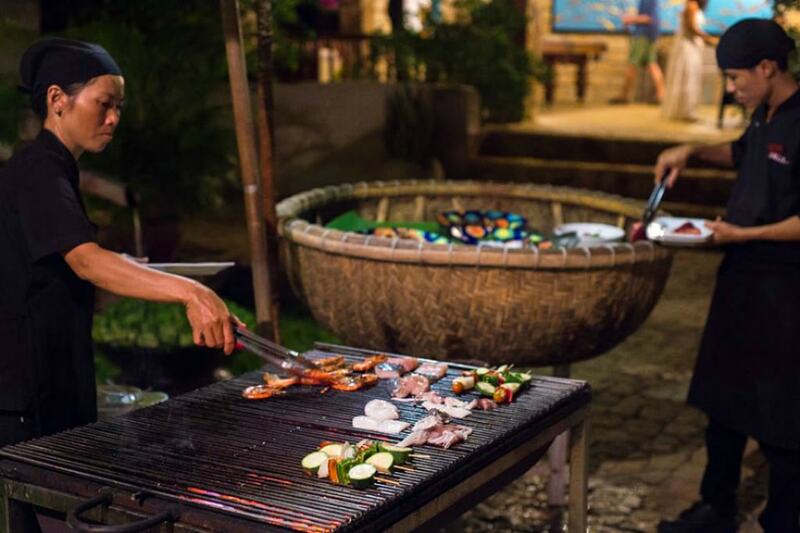 Offering an intimate yet sophisticated ambiance, with a menu that serves Vietnamese and Mediterranean delicacies, Sandals Restaurant is led by master chef, Phil Ward from the UK who ensures that every dish is made to perfection. Enjoy your meal indoors or on the veranda with spectacular views of the East Sea. The sunset will serve as a great backdrop to your meal. A 10-minute walk from Tran Phu Beach, Lanterns is an eye-catching Hoi An-style restaurant decorated with traditional colorful Hoi An lanterns. The menu is a mix of Vietnamese and Western cuisine which includes pasta, salads and sandwiches. The restaurant also specializes in hotpot, seafood claypots, Vietnamese curry and barbecued beef. Lanterns is gaining recognition for being an ethical restaurant, sourcing their food supplies from local fishing villages and using a proportion of profits to support local orphanages and providing scholarship programs and free lunches every week. Half day cooking classes are held four times a week. Opening its doors at 8am, this Greek venue is perfect for breakfast, dinner and lunch. 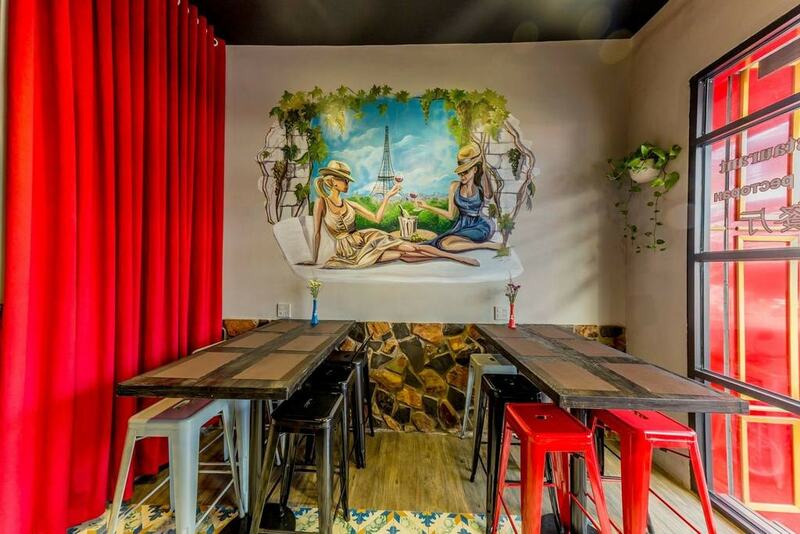 You can enjoy your meal seated on the terrace that overlooks the bustling Hung Vuong Street. Make sure to try the Athens-style souvlaki, a mixture of meat, tomatoes, onions, fries and tzatziki sauce wrapped up in a lightly grilled pita bread. For dessert, diners are served a complimentary Greek pudding. Do call ahead and reserve a seat during peak hours! Closed on Tuesdays. Crowded from the morning till evening, Lac Canh is a favorite among locals. This restaurant is a unique DIY experience – the ingredients to your choice of meal will be handed to you raw, along with a charcoal burner on which to grill. 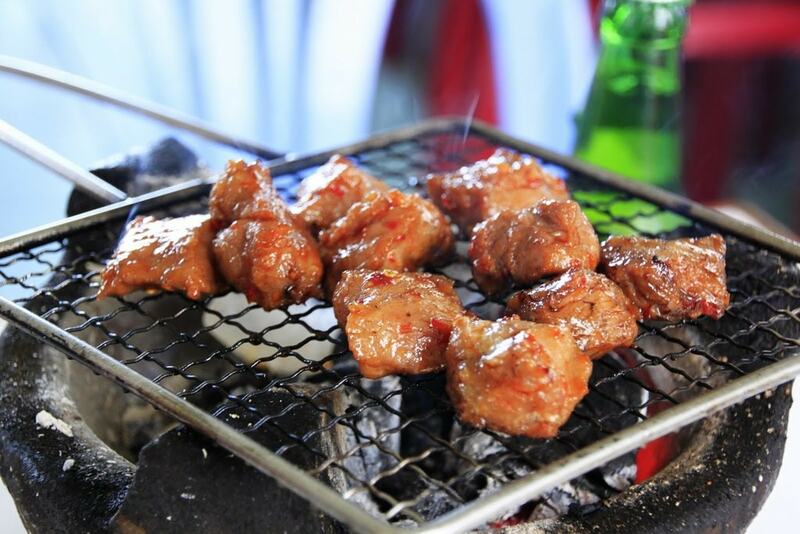 Their specialty is beef, richly marinated with spices, but other meat and seafood dishes are worth a try. Make sure to order a plain banh mi baguette and lather it in the marinade to grill along with the beef. Kiwami is a Japanese restaurant serving the best sushi in the whole of Nha Trang. The setting is intimate and authentic – you can perch on the bar stool and watch as the specialist sushi master chef prepare the delicious rolls. As with any Japanese restaurant, Sake and Sapporo are available. Ganesh is a famous Indian restaurant chain in Vietnam with branches in multiple cities. Conveniently located with a lively setting, delicious dishes and friendly, attentive staff, Ganesh is extremely popular with foreign tourists and expats. The extensive food menu ranges from flatbreads of all sorts, paneers, and various appetizers, to curries and biryani dishes. Vegan and vegetarian friendly. Always busy, this is another Greek joint that is a great place if you are craving some delicious Mediterranean cuisine. The presentation of the food is aesthetically pleasing, delicious in flavor, and portion sizes are generous. Make sure to book ahead to guarantee yourself a seat. 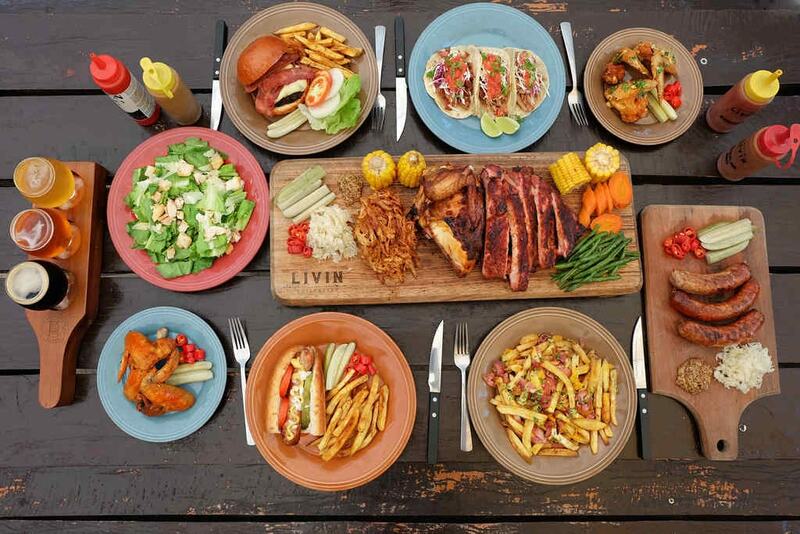 LIVINcollective is a restaurant, retail store, and hangout, all in one. After browsing the concept store that sells funky stuff from local artists and designers, sit down for a while and enjoy a meal. Here you can find not only the best burgers in town, but also delicious smoked barbecue meats, ribs, tacos, lots of craft beer, wine, cider and fine coffee. Closed on Sundays. 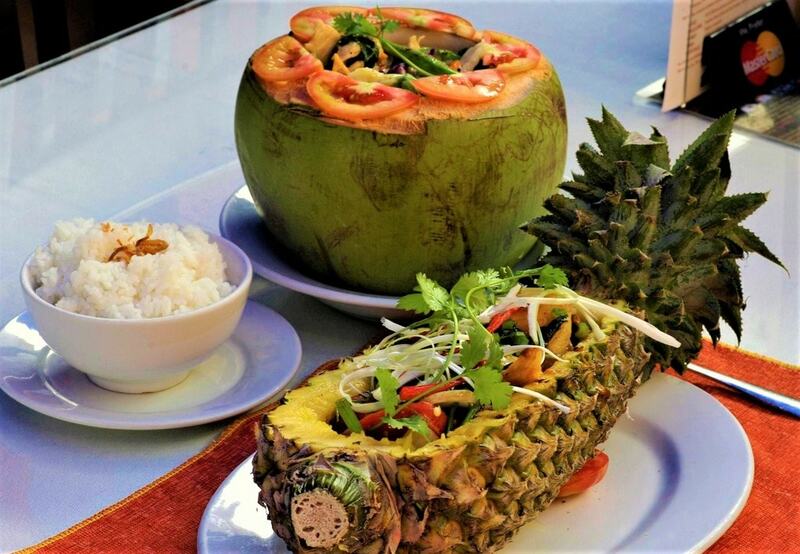 Yen’s Restaurant has quickly become a favorite among locals and expats alike – it is a great place to enjoy some authentic Vietnamese dishes. The soft lighting, traditional music, and soft-spoken staff dressed in traditional ‘ao dai’, all contribute towards creating a mellow atmosphere for diners. On the menu are spring rolls, claypots, noodles, ribs and rice dishes, along with local favorites like pho, banh xeo and bun bo Hue. For authentic Swiss-French fare, this is the go-to. Just minutes from the Tran Phu Beach, this wooden cabin-style restaurant offers a warm and cozy ambience to diners, allowing them to feel right at home. The menu offers a good range of crepes, salads, imported cheeses, grilled beef, lamb steaks, mountain sausages, and even crocodile. Great for a relaxed and calm evening.